On April 30th Mofixx was officially introduced. 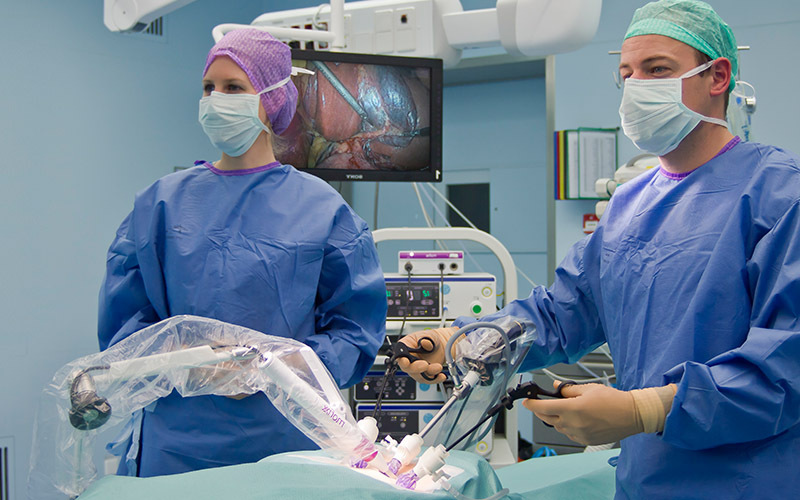 Mofixx is a camera holder that can be used during laparoscopic surgery to produce stable camera images. The instruments no longer have to be held by an assistant, but they can easily be secured to the operating table. An innovative solution for the medical sector that is being developed in collaboration with Indes from Twente. Joris Jaspers, head of the department of Innovation of Medical Technology at UMC Utrecht hospital, is one of the inventors of Mofixx. According to him, many assistants and surgeons have to operate under poor circumstances. During laparoscopic surgeries, also called minimal invasive surgery, they have to maintain a bad posture for hours to hold the instruments. The Mofixx offers a solution for this. Because the camera can be secured to the operating table, more stable images can be made and the surgeon can reposition the camera with one simple press on the button. This way, assistants have more time to do other things, which is also very cost-effective. UMC Utrecht decided to turn to Indes for further realisation of Mofixx. The two parties have worked together for a few years and Indes is known for creating products that support people in their everyday life. Many hospitals have an innovative department to solve problems in the medical sector and to create new product ideas. Doctors often have good ideas for better working conditions in hospitals. Indes is a company that picks up these ideas and makes sure that the idea is being turned into an innovative medical product that patients and professionals worldwide can rely on. Indes established a new company in Enschede for the final development and the marketing of Mofixx: Mofixx BV. Other parties in the realisation are DFZ Participaties and Van Straten Medical. DFZ Participiaties, the innovation company of De Friesland Zorgverzekeraar, is one of the investors of the new innovative product. The Dutch family business Van Straten Medical, a well-known partner in the market of minimal invasive surgery, will distribute Mofixx.